After you say “I do,” it’s time to enjoy your first meal as husband and wife. Whether you want to be the center of attention or sit among your closest friends and family, these head table ideas will get you inspired to dine in style at your reception. 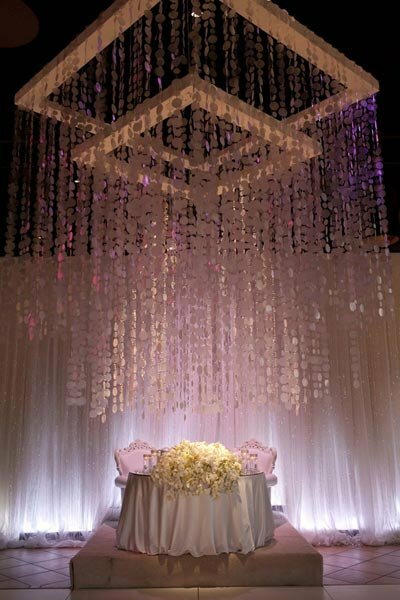 Create a breathtaking display by setting your sweetheart table under a dramatic beaded curtain. To really feel like the center of attention, affix a raised platform under your table and adorn with an overflowing floral centerpiece. Get cozy on a loveseat with your new spouse. Add to the vintage rustic vibe with block letters and a wooden portico. Dress up a simple white sweetheart table with a gold glittery banners and a bouquet as a centerpiece. You can never have too much bling. Complement a metallic sequined tablecloth with hanging bouquets in the background and a bold centerpiece. Use a natural color palette and some leafy green décor for your sweetheart table at an outdoor reception. Set a romantic sweetheart table with beautiful flower arrangements and a twinkling backdrop. Who says you need regular dining chairs? Find a pair of plush chairs, and sit comfortably on your newlywed thrones. A collection of flower arrangements in vases and cascading beads as a backdrop complete the soft yet chic look. A floral tablecloth creates a romantic, lush tablescape. Complement with a full centerpiece (think: peonies and roses) and soft metallics, such as mercury glass votives and gold chargers. Spend some quality time with your new spouse at a sweetheart table that’s in the spotlight. Become the focal point of the reception with a round sweetheart table in front of the reception’s most gorgeous view. For a rustic-meets-romantic sweetheart table, decorate with a mix of lace, burlap, and traditional pink roses. Add a sweet message in burlap with stencils and spray paint. Modern Lucite chiavari chairs get a themed update with “bride” and “groom” signs and draped leis. A tropical flower arrangement completes the look. Let nature be your backdrop by placing your long head table in front of floor-to-ceiling windows at your reception venue. Amplify the romantic vibe with candlesticks and twinkling lights. For ultimate elegance and sophistication, decorate your head table with gold candelabras, and let lush floral arrangements flow over into pillar candles. Create a soft, romantic backdrop for a long head table with string bulb lights glowing against neutral walls and tablecloth. Illuminate a traditional long head table with natural light pouring in from windows. For a winter wonderland theme, decorate with hanging snowflakes. Add personality to a long head table with colorful streamers and a creative sign hanging overhead. Use a white floral wall as a stunning backdrop for the bride and groom. It adds a unique touch without needing much extra table décor. A beaded curtain and block letters behind a classic head table make for an eye-catching backdrop — and adorable photos. Go big with the glam — use sequined chair covers and gold accents to create a wow-worthy head table. If you’re having a more intimate reception, sit with your guests at a long table and enjoy everyone’s company. Sit at a round table located in a prime spot — right next to the dance floor — with your closest friends and family. Jazz up the bride's and groom's seats to stand out from the rest of the table with some sweet “Mr. and Mrs.” signage. Mark the bride's and groom's chairs with subtle signs that coordinate with your wedding's theme. Be the literal heads of the table by positioning yourselves at the end of a long dining table for guests. You can easily converse with your closest friends and family and watch everyone having a great time. Mark your new head chairs with customary “Mr. and Mrs.” signs.